Taeanhaean National Park was designated as the 13th national park in Korea in 1978. There are 26 beaches along the 230km coastline, which encompasses the Taean Peninsula and Anmyeondo. 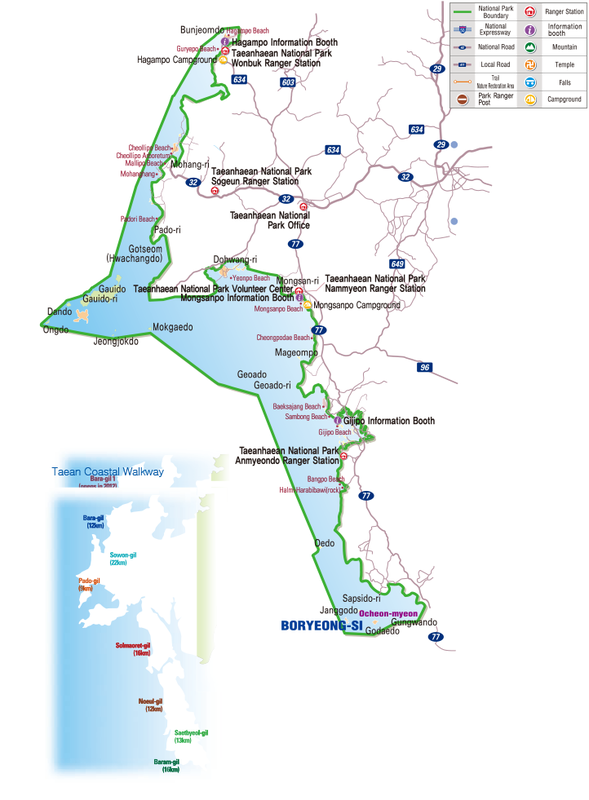 The park’s total area is around 326㎢, and ranges across Taean-gun and Boryeong-si. There are 72 islands scattered across the calm sea, of which only four are inhabited by people. The name “Taean(Big comfort)” comes from the fact that the region did not suffer big natural catastrophes throughout history, and coupled with the mild climate and an abundance of food, it made for a non-weary life,. The foreshores, sand dunes, mystical rocks and islets that spread out along the rias styled coastline boast beautiful scenery that can only be found at the West sea. As the only marine park in Korea where various coastal system coexist, there is a great value in preserving Taeanhaean National Park. After the Seohaean(West Coast) Expressway opened, many visitors come to enjoy relaxation. At Taeanhaean National Park, the axes of the coastal ecosystem, the sea, foreshore, sandy beach, coastal sand dune, pine forest, and swamp are intact, creating a blessed condition for various plants and animals. The park is home to 1,195 animal species, 774 plant species, and 671 marine species. There are also 17 endangered species, including Swinhoe’s egret, Korean golden frog, and Otter. There are also protected Natural Treasures, such as the mandarin duck, Common kestrel, and osprey.